I’m pleased to announce that Geek Girl Stuff will be at Rose City Comic Con this year! Come visit our booth for geekery, digital prints, and more! I’m also very excited at the completion of my first digital painting! 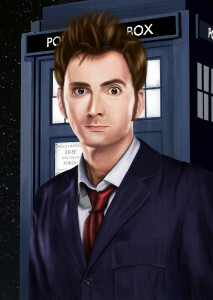 My husband got me hooked on Dr. Who, so I thought it was only appropriate to paint the 10th Doctor, played by David Tennant.